One of the highlights of my sister's big birthday bash was the Faux Pâtisserie we put together to help dress the party room. It was filled with wonderful pastries, cakes and chocolates, all of which were crafted from supplies you can pick up from your local craft shop. 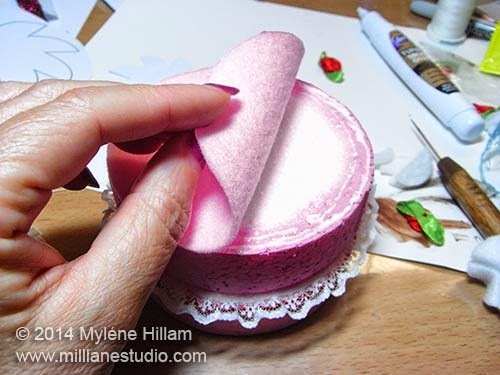 Today I'm sharing the "how-to" for making your own mini gâteau like the pink one below. 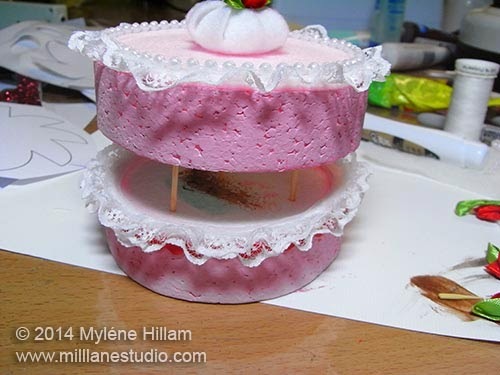 For this example, I've used polystyrene disks, acrylic paint (which sticks surprisingly well to polystyrene! 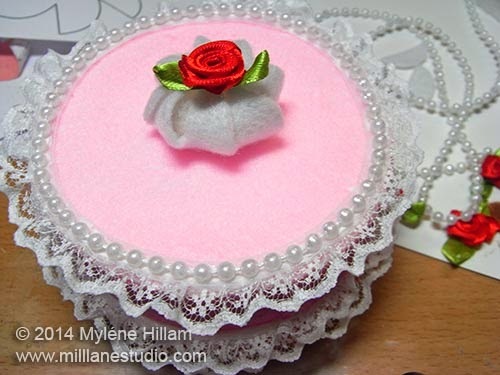 ), ric rac, lace, felt and a ribbon flower. 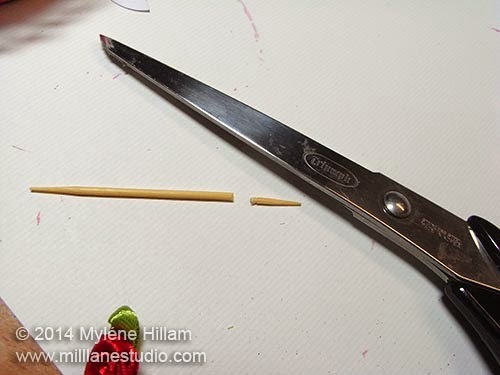 I also used Aleene's Tacky Craft glue and some toothpicks to hold things together. 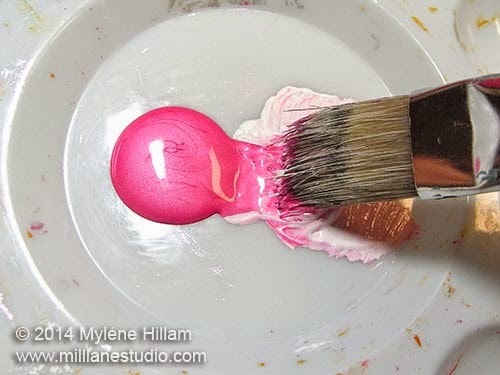 If you've got white acrylic paint in your craft supplies then you can make a pastel shade of any colour paint you have. Pink seemed like a good idea for this cake. All you need to do is mix a little of your chosen colour into a LOT of white paint. You can see I had way to much pink paint here but it shows you just how intense the colour was before I toned it down with white. 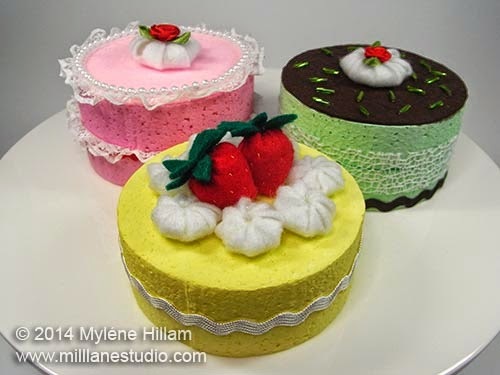 For this mini gâteau, I used disks that are approximately 10cm (4") in diameter and 2.5cm (1") high. 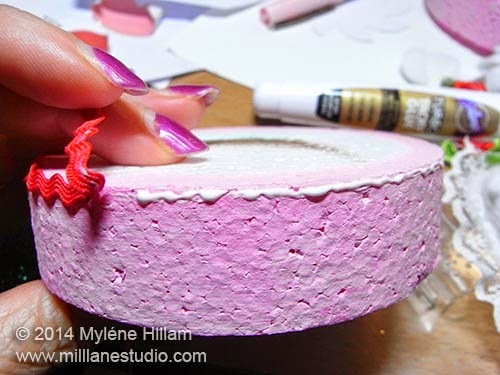 Apply the mixed paint to the sides of the disks. You can add a little to the top edge too to make sure there is no white showing. You'll need to work the paint down into the pits and dimples of the foam for a uniform finish. 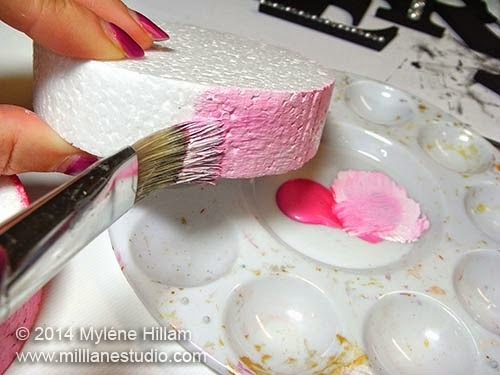 Because the foam isn't porous, the paint will take longer than usual to dry so just be patient with it. Once both disks are dry, apply the adhesive around the top edge of one of the disks. A length of red ric rac makes a pretty good looking layer of jam. 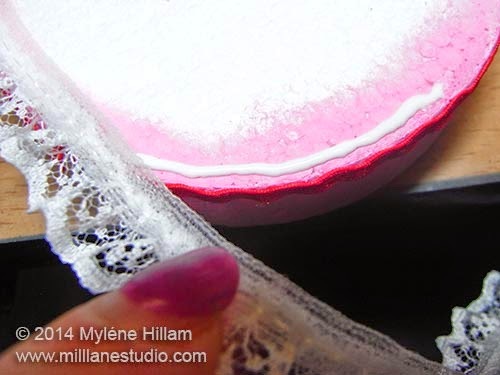 Now add the cream - a layer of white ruffled lace which will end up being sandwiched between two layers of cake. 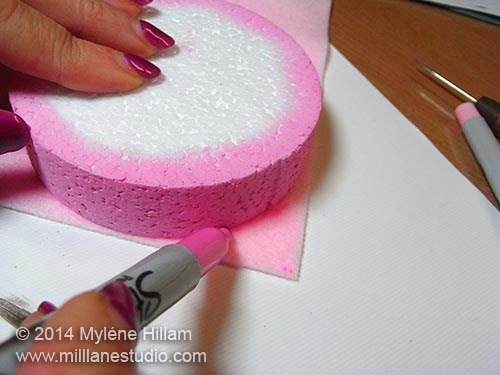 Place the second foam disk on pastel pink felt and trace out the disk with a marker. Cut it out just inside the marker line so it's the same size as the cake. Glue this layer down on top of the second disk. 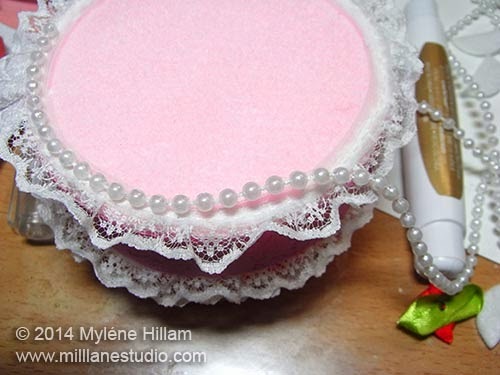 Add another layer of lace and a string of beads to represent more cream and some piped icing. and inserted them into the bottom layer. Line up the top layer with the bottom before pressing the two layers together. 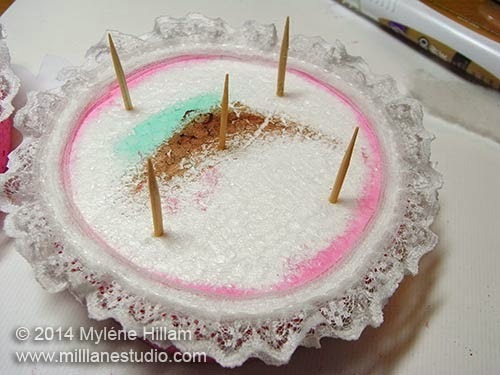 Tip: With the bulk of the lace inbetween the layers, I found this to be a better solution to using glue but if you're using these for a children's play tea party, then glue them together with foam glue. Finish the cake off with a dollop of cream and a ribbon flower. I used this tutorial and template from Hello Ashley Ann which is very easy to follow - just resize the template to suit your cake size. 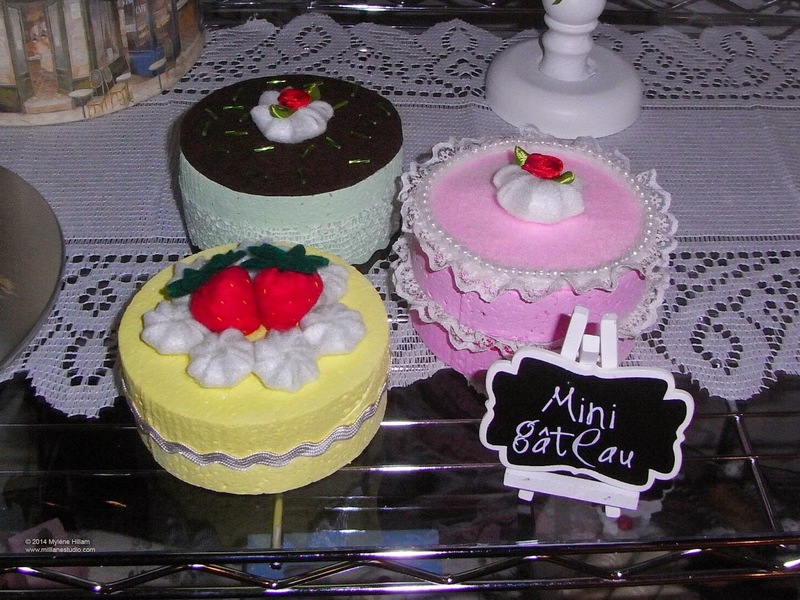 Isn't this just a darling mini cake! Let your imagination run wild with decorating ideas and use up whatever little bits and pieces you have on hand: lace, fabric, ribbon and trim. What about a chocolate and mint combo with twisted bugle beads to represent mint flakes! Or a lemon gâteau with felt strawberries and cream! Here's the tutorial on how to make the strawberries.